Ankle ligament sprains and tears are one of the most common injuries suffered everyday by patients. These injuries cause pain and instability and often recur. If left untreated patients are more likely to develop arthritis of the ankle. 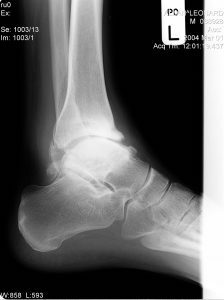 Ankle conditions are usually managed well with the use of orthotic therapy, “moon boot” and braces. Sometimes extra corporal shock wave therapy is used to treat ankle pain or ligament strains Read more. Often our podiatric surgeon will prescribe non-steroidal anti-inflammatory drugs(NSAIDs) or administer cortisone injections to treat ankle pain or ligament strain Read more. Where a patient’s ankle joint has become chronically unstable due to a torn ligament or there is ongoing ankle pain surgery may be required.